This is a UK-based company with available opportunities for Virtual Assistants. The starting pay is $16-$20 per hour. Hours are flexible with a minimum requirement of 20 hours per week. This freelance company is always seeking talented writers. Worldwide opportunity. The company currently needs a Remote Quality Coding Auditor. US only. –Read review– This company is actively hiring home-based Chat Agents. This is a 100% non-phone work from home position. Starting pay is $9.50 per hour with paid training. Open to multiple areas. A mobile building app platform is looking for long term writers to help write content regarding mobile app development on their blog. The company is currently seeking Part-Time Customer Service Reps. You must work a minimum of 15-20 hours per week. US only. ABC Financial- more detials is hiring again for home-based agents in Texas, Arkansas, North Carolina, and Florida (Click the link for your state to apply). We actively looking for a Blogger/ Social Media Whiz to join the team. Starting pay is $16-$20 per hour. Hours are part-time, 15-20 per week. 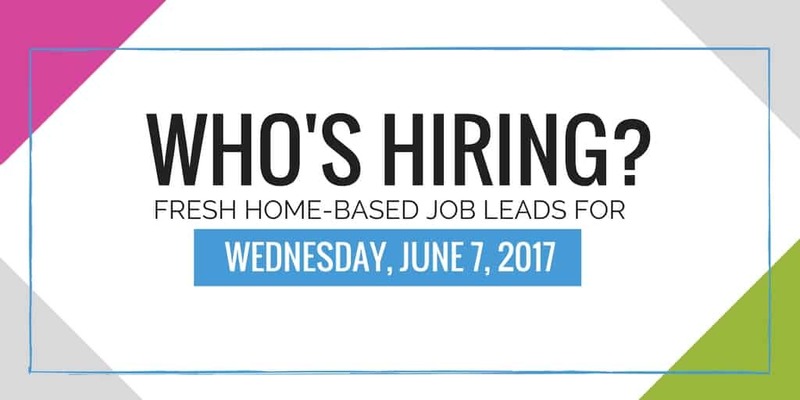 The company is actively seeking Home-Based Chat Customer Service Specialist to work from home. Starting pay is rate is $9 per hour. We are looking for qualified ESL tutors. You will work on a part-time remote basis and earn competitive hourly rate ($16-20 per hour). It’s always great to get updated with such latest job leads from your site. You’re doing really fantastic to help work at home moms to find their dream home based job.